Perks of Big City Living – Where in the world is Kelly? Surabaya–my adopted home for the next year–is a big city. The metro area has 7.2 million people and the alleyways and malls of the city itself seem to sprawl forever. My home is technically in Sidoarjo, the small neighboring town… of 2 million people. Living in Indonesia’s second-largest urban area comes with the obvious challenges of heavy congestion and higher costs. Already I know I am spending at least double what I did when I lived in Pangkal Pinang last year. Part of this is due to lifestyle choices, but many things also simply cost more. 1. COOL THINGS HAPPENING ALL THE TIME! 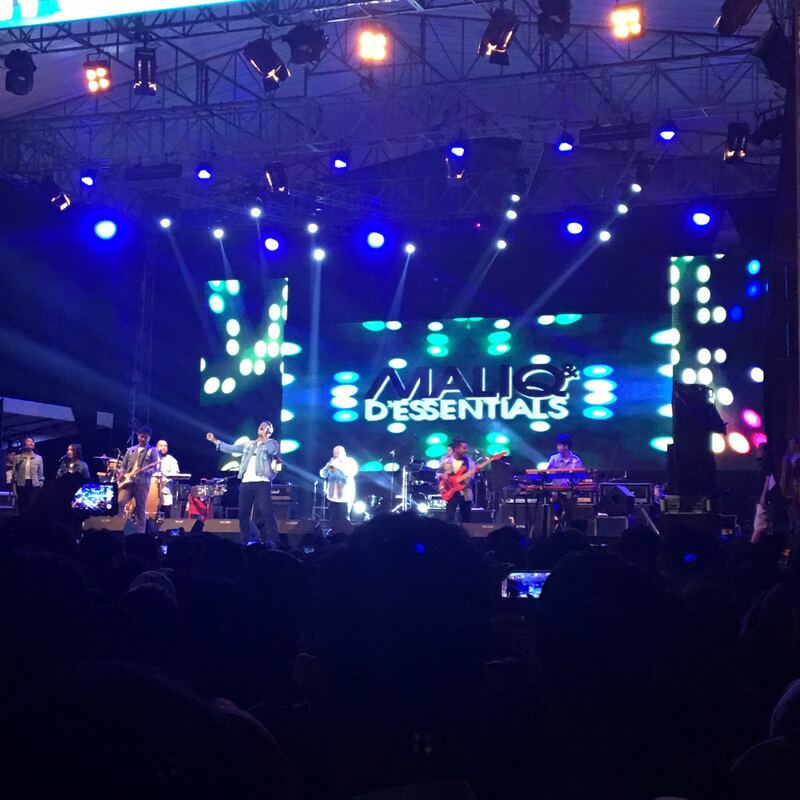 Case in point: last month during orientation in Bandung, Rizqi (from AMINEF) got me into a band called Maliq & D’Essentials. I’ve been jamming out to their music ever since I got home and it turns out this band is pretty famous in Indonesia. Lo and behold, last Friday I was at a jumbo exhibition of Indonesian handicrafts with some Ibus from school when I saw that none other than Maliq & D’Essentials would be headlining the closing ceremony Sunday night. Krupa and I went together and it. Was. Epic. Then at the concert there was an announcement that Iwan Fals (another super-famous Indonesian musician and singer of my favorite song Bento) would be in town next month, so I gotta go to that. 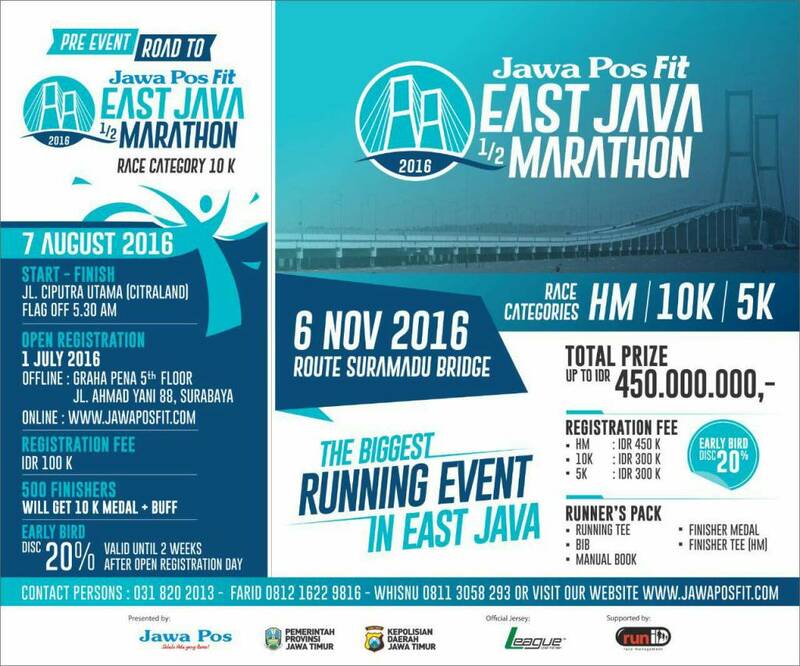 Then on the way home I saw a billboard for an upcoming half marathon/10K/5K across Southeast Asia’s longest bridge, which happens to be in town, so we might well do that too. And… And… And… The list could go on. I’ll be keeping my eyes and ears open the whole time I’m here to make the most of my time in this metropolis. This band is good on recordings but even better live. They had 10 people jamming out on that stage! 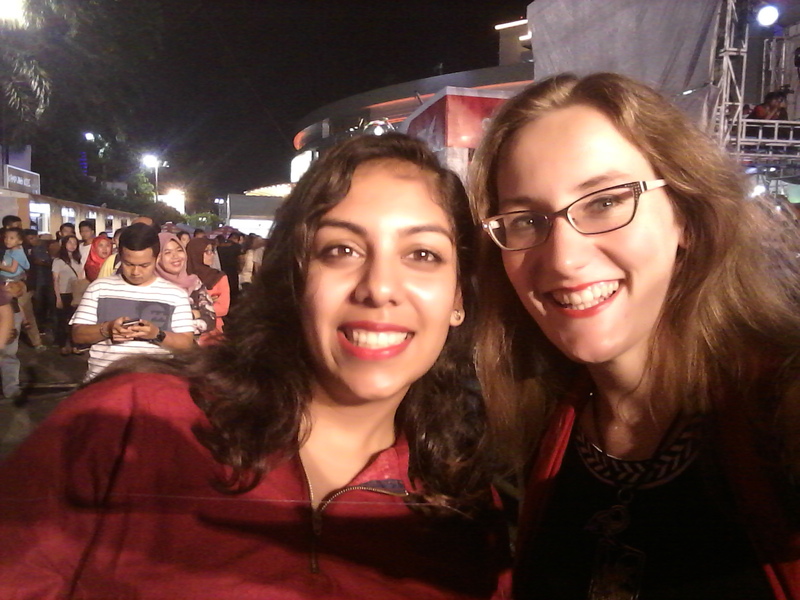 Krupa and I looking pretty cute at the concert last night! I’m signing up for that 5K! 2. EVERYTHING IS JUST A GOJEK RIDE AWAY! In my last post I shared my love for GoJek, the ride-sharing app for motorcycles. Surabaya is also cool enough to have an abundance of Uber drivers constantly plying the streets in their clean, spacious automobiles. Getting around town with GoJek and Uber (and taxis, if I’m desperate) is incredibly convenient albeit slightly costly. While 20,000 rupiah (~$1.50USD) to GoJek to the nearest mall doesn’t sound like that much, keep in mind that I only spent that much on gas for my motorcycle for an ENTIRE WEEK in Pangkal Pinang. Thus, transportation here is exponentially more expensive. Even so, I’m happy to keep paying my GoJek men to get me safely through the wild and winding streets of Surabaya. 3. MEETING ALL THE PEOPLE! I mentioned this as a highlight in my recent “Highs and Lows” post but it is worth mentioning again: Surabaya is a hub for all kinds of groups. From the U.S. Consulate to Couchsurfing, there are a lot of different circles of people that I have only just begun to connect with. Last week I visited the Consulate and had a lovely lunch with some of the Officers there (thank you again, Christine, Rum, and Erica!) 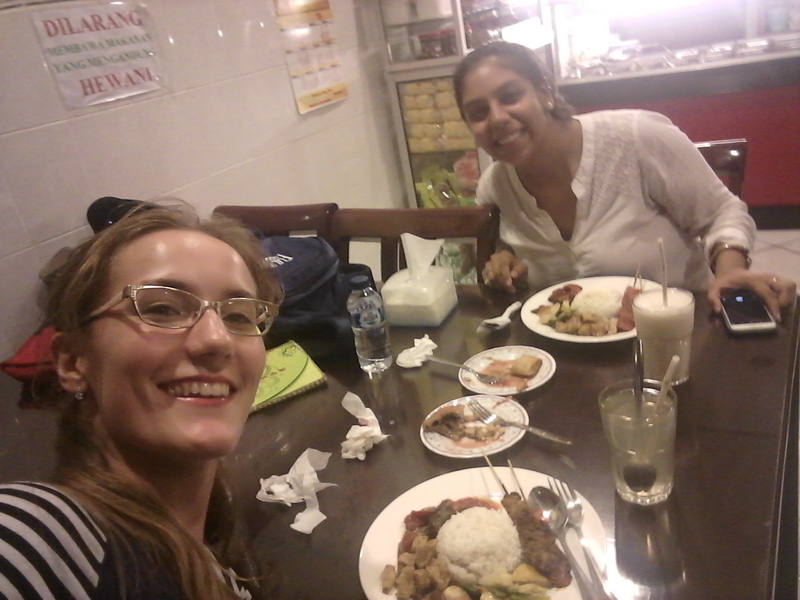 and that lunch was followed by dinner with Krupa and Mas Teguh, one of Grace’s friends from Malang who works for the Peace Corps office in Surabaya now. 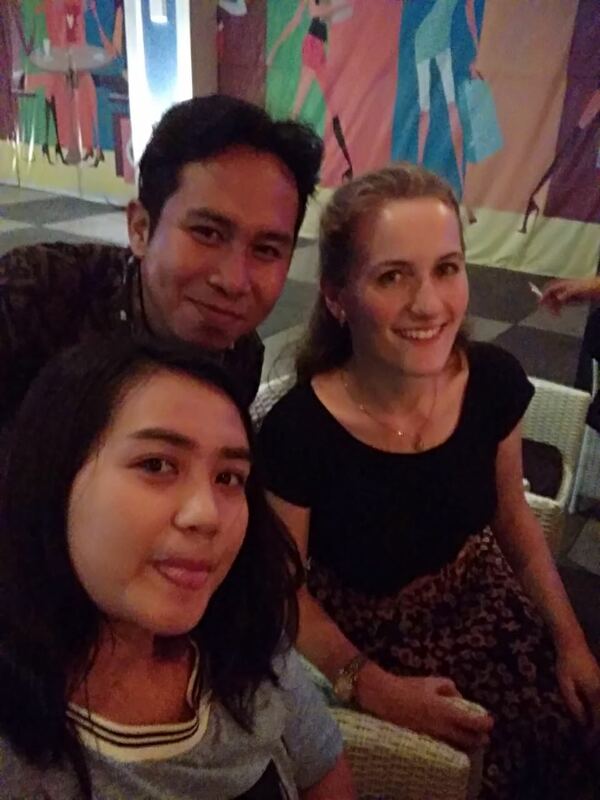 This week I am going back to the American Corner at Universitas Airlangga and this weekend I am having a party to bring together all the people I have met so far. I’m keeping my social calendar full, and that’s not to mention my school events and hanging out with local Indonesian friends! 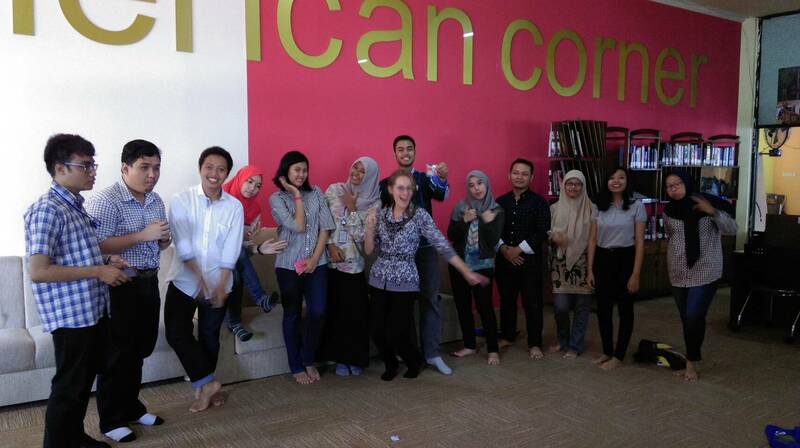 Chillin’ with all the cool kids at AmCor (American Corner) a couple weeks ago. 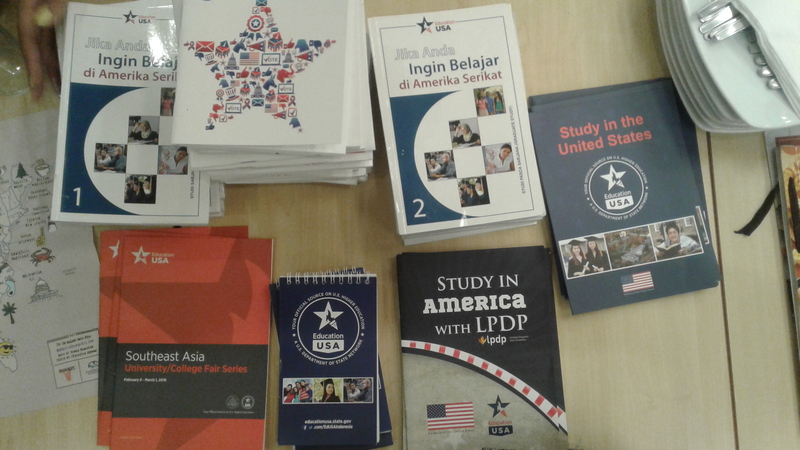 Lots of GREAT swag from the U.S. Consulate, ready to be shared! Mas Teguh! So nice to meet you! 4. SMALL COMMUNITIES ARE EVERYWHERE! One of my favorite parts of living in Pangkal Pinang was the small-town feel and how well I felt like I knew the place after a year of living there. While Surabaya is a massive place, there are lots of little neighborhoods that make the city feel like a collection of small towns. My house is in an area called Sepanjang, my hangout spots are in an area called Kebun Sari, and Krupa lives in Wonokromo. By breaking the city down into these little pockets were I spend most of my time, I am able to feel like I am getting to know this place better while holding onto that small town feeling that I liked so much last year. 5. OPTIONS FOR VEGETARIAN RESTAURANTS! Being able to eat all the food on the menu makes Krupa and I very happy humans. One of the low points I mentioned in the “Highs and Lows” post last week was that I am having a hard time eating healthily–or even just eating at all on certain days. Although this can be a struggle, that is not to say that Surabaya doesn’t have vegetarian options. In fact there are a TON of veggie-friendly restaurants in town, and Krupa and I have been checking them out one by one. The only reason I don’t eat at them every day is because none of them are exactly close to my house and often I would rather eat at Rolag or Angkringan Batik; both are cafes close to my house with great atmospheres where I have become a regular fixture… they don’t even need to ask for my order at this point. Still, there are plenty more vegetarian restaurants we haven’t tried that we’ll have to check out in the coming months. 6. STUNNING NATURE JUST ON THE OUTSKIRTS OF THE CITY! I haven’t made it out to any of the forests, volcanoes, or waterfalls that everyone keeps telling me about, but I know I’ll get there at some point this year. I love nature and it will be great to see some of the lush and lovely Javanese scenery that I keep hearing so much about. According to my friends, the nearest places worth going are just a little over an hour away. Full report coming soon! I went to SUTOS in the wee hours of the morning this past Saturday with some of my new Indonesian friends, Robby and Ani and several others. Great times with great people and no one batted an eye at my bule-ness. 7. THERE ARE PLACES I CAN BE A BULE IN PEACE! While in my daily life I hear “Hey Mister!” and “Bule!” most places I go, there are certain expat-frequented areas where my blue-eyed, blond-haired strangeness warrants no more than a passing glance before whoever is looking goes back to staring at their smart phone. And let me tell ya, feeling “normal” is nice. 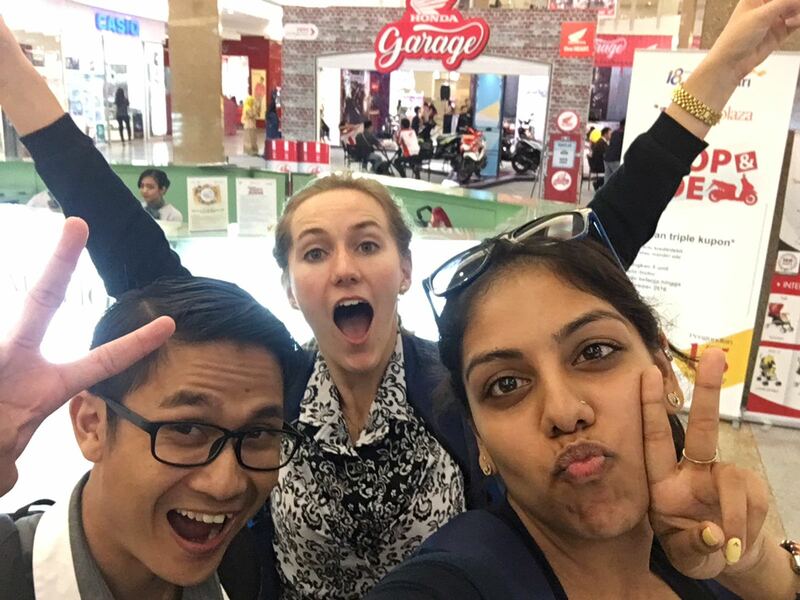 Places like SUrabaya TOwn Square (SUTOS) even have restaurants and bars where bules can go to do bule things like eat pizza and wear tank tops and look at other bules and even drink alcohol… in public! It sure is nice to not have to wait for mid-year in Jakarta to be a bule in public in peace. 8. IT IS EASY TO GET OUT AND AWAY! As much fun as I am having in the big, bad city, there will come a time when I want to get out for a bit. It is a privilege to live on Java where we have options between planes, trains, and automobiles. My house is 30 minutes from the airport, and from there Bali is just 40 minutes away, Jakarta is 1 hour and 15 minutes, and Jogjakarta is a little under an hour. A direct flight to Singapore takes just 2 hours and 20 minutes, and from there the world is my oyster. I don’t have any travel plans yet, but I am fortunate that getting from here to pretty much anywhere won’t be difficult. Kelly, it is so nice to know you are meeting folks. Having friends can make all the difference. Thanks for the post. I love ya. You look and sound great Kelly! Love and miss you! I second what your Dad and Aunt Betsy. Indonesia is sounding better in this post. I was a little worried last post. My advice when you’re lonely get out with people. When we get depressed know that the same things always triggers the blues. As we get older we can look back and remember what has worked in the past to lift our spirits. Exercise always works for me. We love you Kelly. Keep up the good work.